Mostly healthy eats and a few sweet treats. 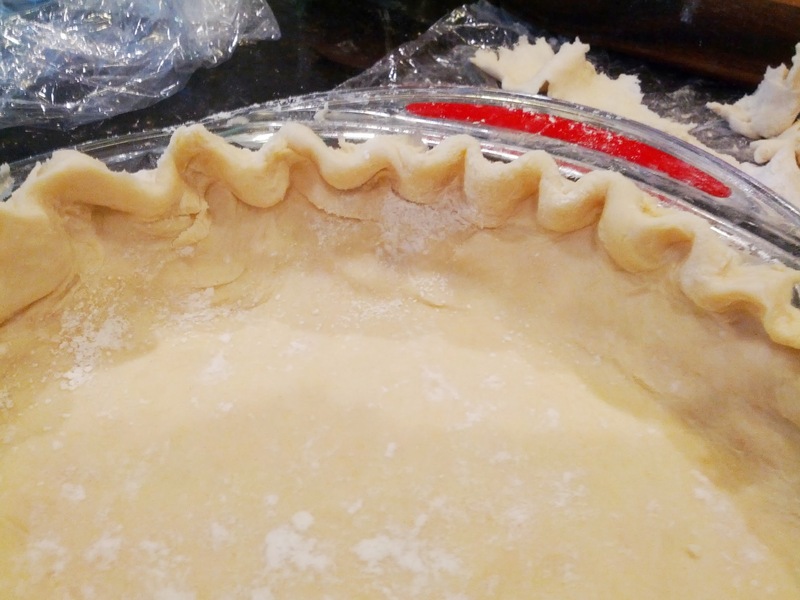 An easy, quick way to make homemade pie crust. 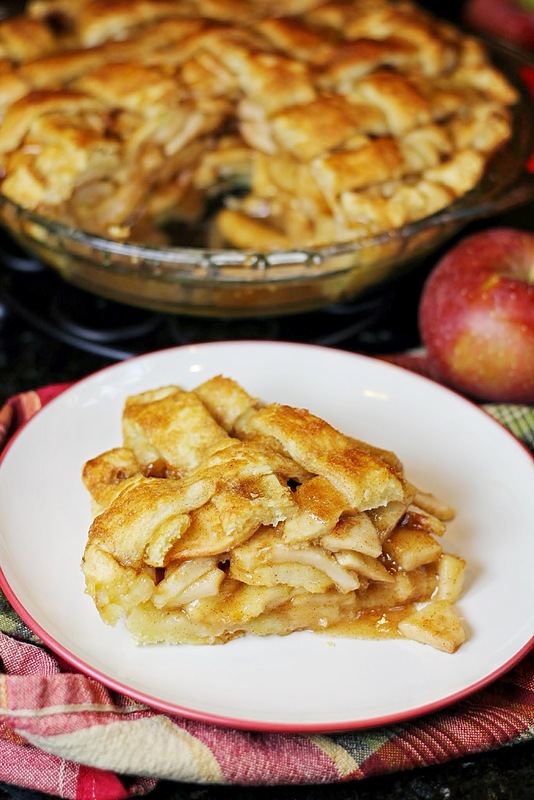 It’s my go-to for every pie, including my family’s favorite: apple! Making homemade pie crust seems to intimidate many home bakers. 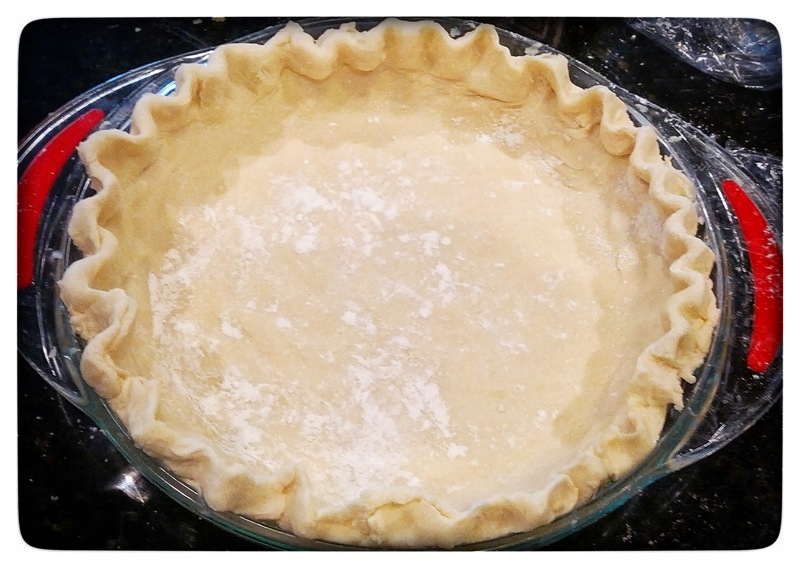 I, too, used to be one who never thought I could (or wanted to) make my own pie crust. “What’s wrong with the frozen one from Pillsbury?”, I used to think to myself. 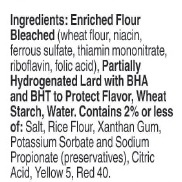 That all changed the first time I had homemade pie crust (and looked at the ingredients list…see below). Y’all, it seriously makes all the difference in the world as to the result of your final pie. It takes a good pie and makes it something special. And really, if you’re going to go through the trouble of making a pie, it is not that much more work to put together a pie crust from scratch. Especially if you use this one minute recipe! When I first started making pie crusts, I did it the old fashioned way: by hand. Cutting the butter into flour without even a pastry blender was a little tricky. Eventually I bought a pastry blender, and at the time I thought it made it immensely easier. You know what can take it from easier to just plain easy? No thank you! We can all agree that pie is not the healthiest thing to eat, but I figure if I’m going to eat pie (which does not happen often), I would rather put in the extra minute to make it homemade with real ingredients! And, in case the food processor trick is not enough of a delightful kitchen tip, I have another one to share. 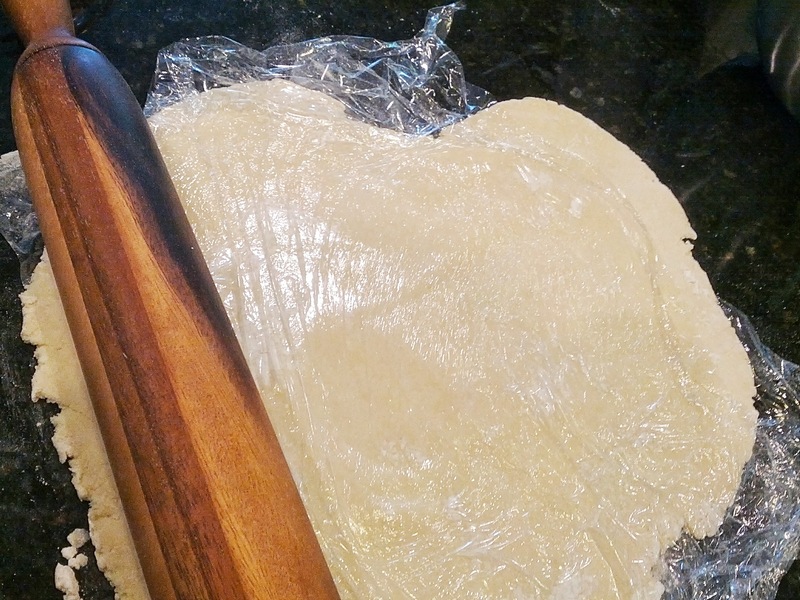 Have you ever had pie crust stick to your rolling pin when trying to roll it? It is highly annoying, and could potentially turn any baker away from making their own pastry. To remedy this problem, simply roll your pie dough in-between two sheets of plastic wrap!! It prevents the dough from sticking every time. Once you have refrigerated and rolled out your pie crust, you can decide how you would like to form it. I always love the classic look of pinched edges and a lattice crust, but you can be creative! Remember, rustic is okay here: you want your pie to look homemade! I wanted to share this special recipe with you before the holidays come to hopefully inspire you to make your pie crust in lieu of purchasing one for all of your autumnal/holiday baking. And, in case you didn’t know, it’s currently apple picking season! This recipe makes a single crust (with some leftover). If you are going to make a double crust pie, you must double the recipe! 1) Place flour and sugar in a food processor. Pulse. 2) Add about half of the butter. Pulse. Add the rest of the butter. Pulse until the mixture turns into coarse crumbs. 3) Through the feed tube, slowly add the ice water and pulse until the dough gathers up into a ball. If it doesn’t after a few seconds, add a few more drops of ice water until it does. 4) Take the dough and flatten it into a disc and place it on a sheet of floured plastic wrap. Refrigerate for about 30 minutes before rolling. Remember to use the plastic wrap trick from above! Is this for a one or two crust pie? Question: Do you think a Kitchen Aid mixer would work? I don’t have a food processor, though I have a vitamix, but I’m afraid it’d get stuck at the bottom (i’ve had issues before). Thoughts?? Happy Thanksgiving! Hi Heidi! Yes, that list of weird ingredients is pretty eye-opening!! I’ve never tried making the crust in my Kitchen Aid mixer so I can’t say for sure, but I think it would work with minor adjustments. The food processor blade is sharp and cuts the butter quickly, but the mixer won’t. I would slice the cold butter very thinly (1/4″) before adding to the flour so hopefully it will get broken up easily. You may also need to pop the bowl in the fridge halfway through to make sure the butter stays cold. You can also always make this by hand using a pastry blender to incorporate the butter and flour, it will just take a few minutes longer and some elbow grease! Hope this helps! Have a very happy Thanksgiving! you can get a pastry attachment for the kitchen aid mixer. Do not use the vitamix. Not the same texture, not the same flakiness and definitely so much harder to clean. Personally I go with the knife and meticulously control the size of my granules. I do this while one of the kids is prepari g the apples, so no time loss. I tried the food processor and I’m not crazy about the texture. It takes all the delicate touch away. I also use 1 tsp salt vs sugar. Enough sugar in the filling. Salt accentuates flavor. I will add some cinnamon however to the crust for sweet pies vs savory pies. Cinnamon is a natural sweetener without the bad side effects. Can you leave the dough in the fridge for longer than 39 minutes? Yes that’ll be fine! It just needs at least 30 minutes to make sure the butter is solid again. That’s what will give you a flaky pie crust. When I was making this I followed the steps but it turned out to be to creamy for my pie. Any tips to make it better for me next time. When I pulsed it was to creamy to even pour on plastic wrap. Oh no! That’s never happened to me before! It sounds like you had way too much water or you processed it way too long. Be sure to only add a tablespoon of water at a time and only pulse until the mixture starts to clump up in one big ball. Hope it turns out better next time. Hi could you clarify this for me? Do I roll the dough into a disc first, or do I refrigerate first? Sure! You don’t actually roll it into the disc form before you refrigerate it, you just gently mold it with your hands on the plastic wrap until it’s mostly disc shaped. It doesn’t have to be perfect. Then you’ll refrigerate it and actually roll it out from there. I hope that helps! This is my first pie crust I will be making! And I will be doing it by hand only. Any tips to make sure I mix the butter and flour mixture right? That’s so great that you’re trying something new! The recipe really turns out best in the food processor like I stated in the post. Do you have one? If not, do you have a pastry blender? It’s going to be much more time consuming to do it with the pastry blender by hand but it can be done. It’s much harder because you have to try to work quickly so the butter doesn’t melt, but you want to make sure to break down the butter chunks as much as possible. The butter/flour mixture when combined should look crumbly and ideally, it should be pretty uniform. It’s much harder to achieve that by hand, though. I hope it turns out great! Good luck! Yes I do have a pastry blender. But I’m used to doing it by hand when I do other things. I’m pretty quick at it. Is there another piece crust you would use with out a processor? Oh no I realized the butter in have is only 1/2 cup sticks. They are short. How many Cups or so for the crust and pirate do I need? Sorry….but I want your pie! Are there tablespoon markings on them? If they’re in 1/2 cup sticks that means there’s 8 tablespoons in each stick. Yes they are half cup sticks. Not full cups. Do I follow the recipe the same or is it more butter? You need 12 tablespoons for one pie crust. A regular 1/2 cup stick has 8, so you need 1.5 sticks to make one pie crust. Hope that helps. Good luck! Help!!! Just tried this and something is very wrong!! I wanted 2 crusts (top and bottom) so I doubled like it says. I used almond flour (researched first, apparently easily interchangeable with white flour). Everything was fine until the second half of the butter (which in this case is another 12 tablespoons since I’m doubling recipe) it’s now a very messy way too wet consistency. Even with only a few tablespoons of water added. Seems like way too much butter. How do I salvage this?? Using high quality Kerrygold butter has me panicked a bit. That stuff isn’t cheap…. I have made many things with almond flour but not pie crust–pie crust can be tricky with regular flour, let alone substituting all of it for almond flour! In my experience, almond flour always changes the texture and flavor of baked goods. Since pie dough is really 2 ingredients (flour and butter), those changes are amplified. I’m sorry to hear that substitution isn’t working. I would try to add more almond flour if it’s too wet. At this point your guess is as good as mine. I’m sorry I can’t promise results without regular flour! Yes please do! Good luck. Can I make pie crusts ahead of time and freeze them? If so, would it be best to freeze them before or after rolling them out? Hi Isabel! I’ve heard you can freeze pie crust but have never tried it myself, so I don’t know how to advise you to proceed. It’s a great question. I’m sure a quick Google search could lead you to a good answer, though! Hello there, I can’t wait to try this recipe but I have a few questions before I do..
Hi Victoria! Yes, you should be able to refrigerate the dough overnight. Not sure about the manual food processor but it sounds like it would work! I can’t wait to try this for thanksgiving! Can i use a regular blender since i don’t have a food processor? Also, should i change anything for being high altitude? Thanks! Not sure about either of those Katlyn! You might need to do some Google research and see what the consensus is. I know usually baked goods do require alterations for higher elevations but since I don’t live in that kind of area I don’t know much about it. When you talk about using a food processor…..I have one but i use it so rarely…..but you are talking about using the blade attachment, right? It will work with either. If you have both, use unsalted. Can you give me the instructions for me to make the crust by hand please. I do not have a food processor. Follow the instructions the same way, just use a pastry blender to incorporate everything instead of a food processor. I have a Ninja blender. Could I pulse in that? Anne I’ve never tried it so I don’t know. If you try it please let me know how it turns out! I live in Florida. I really think the humidity affects the dough. The first batch only needed a half a tsp. of water (I used a bit too much and ended up having to use more flour).I was shocked, but it really is humid. I’m doing a sample one tonight and tomorrow I will do the real deal to work out any kinks. First time doing homemade pie crust. Thank you. Wow only half a tsp?! That’s almost hard to believe! I’ve always need several tablespoons, but you’re right–humidity definitely can affect the dough. There have been times I’ve had to add more like 7 or 8 tablespoons–could have been due to the lack of humidity! I want to apologize if your ears were burning. In my sleep deprived mind I read one 3/4 cup of flour, not 1&3/4 cup flour and have found my dough falling apart as I was rolling. The random pieces that I’ve gobbled up are delicious. Thanks for the recipe, I needed a new sweet pie dough. Next time I won’t attempt this at midnight on Thanksgiving eve after a 10 hour work day, lol. Aw so sorry you misread the amount! I’m glad it still tasted good even though it was hard to roll. I bet it was extra buttery! Do you bake this crust before adding the filling? If so what temperature and for how long? Nope no need to pre-bake! I made it without baking the bottom crust first and it didnt cook. It was very doughy, the top one was perfect, golden brown. I thought I made a mistake and missed where It says to bake bottom first. I knew I followed the directions perfectly but thought I had to have missed that part. After checking just now I realize it wasn’t ever mentioned. Why do you think my bottom crust didn’t cook? Should I just bake it next time and then add filling and top crust? That is very, very strange. I’m so sorry it didn’t turn out well for you! No it doesn’t have to have a feeding tube. You can stop it, pour a tablespoon of water in and start it again. I’m actually not sure what size mine is but I know it’s not a mini one–i think it’s just a standard size! The dough usually firms up in the fridge but also starts to thaw out quickly. In your case, it sounds like it’s too dry (too much flout). I love your pie crust recipe! using a 13×9 inch pan. 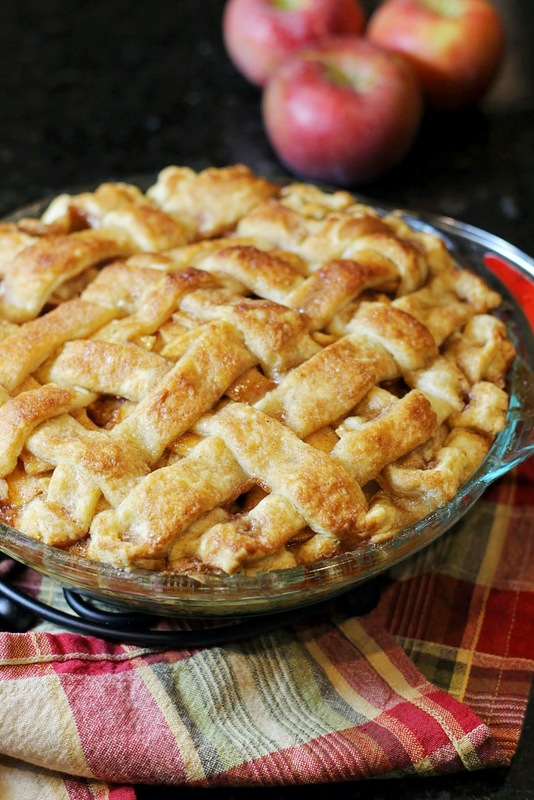 How many recipes of your pie crust should i make if baking a double pie crust? Hi! I’m so glad you love it! A slab pie sounds awesome, but I’ve never made one myself, so I’m not sure how many to tell you to make. For a regular double crust pie you need two, so I’m guessing 3 for a 9×13? Maybe 4? I’m not sure! I’d probably start with 3 and go from there. Let me know how it goes! I’ve never made a pie crust before, so this question might pretty basic – but should the butter be cold or room temperature? Thanks! It actually needs to be very cold and straight from the fridge! Try to work quickly so you don’t have it sitting out long at all. That’s key to making a good pie crust. I’ve never tried it personally, but I did have a reader comment that she used a stand mixer and it worked well! Good luck! I am planning to make this crust for a pumpkin pie. How long should I cook the crust for (with no filling)? Thanks! How long would i bake the crust if using it for a lemon meringue pie that needs a pre baked crust? No, I’d use butter for the best flavor. This was *so* easy! I wasn’t sure if it was going to come together at first, and then, like magic, it formed into a ball! My husband really liked the flavor and texture of the crust – not too doughy, not too crumbly, and really tasty on its own (though the caramel sauce on top might have something to do with that!). Thanks for sharing this great recipe (and the genius plastic wrap tips)!! That depends on the pie recipe! Reference the blueberry pie recipe you’re using and follow the instructions there. Is it better to make each crust separately or to just double it? I don’t think my food processor is big enough to double it so I’ve never tried. I imagine it would probably work just fine, though! Let me know if you try it. SOUNDS GREAT. ANXIOUS TO MAKE. What if you don’t have a food processor? Would a ninja pulse blender work with the paddle looking attachment? Just won’t be able to pulse while adding water, would that be an issue? If I were you I would use a pastry blender and do it by hand. The food processor just speeds the process up. I don’t have a ninja so I can’t speak to that personally but I’d be hesitant. Do I need to take the pie out the oven while it reduces temp in the middle of baking? No. It’s actually important not to do that and to try to leave the oven door closed while it bakes. Hello, Should the butter be room temp or cold/refrigerated? Definitely cold! The colder, the better. Thank you! About to start making it now!! Hi! Thanks so much for your kind words! So proud of you for branching out and making crust from scratch! I believe it’s 110g based on the Google search I just did 🙂 I hope that helps! Good luck–you’ve got this! Do you have to bake the pie crust before you fill it? The Best Apple Pie EVER. Grilled Asparagus and Zucchini Salad with a Lemon and Basil Vinaigrette. Gluten-Free Soft-Batch Chocolate Chip Cookies. 5 Ingredient Easy Garlic Butter Roasted Mushrooms.